NPCA honors eight organizations with the national Marjory Stoneman Douglas Conservation Award for their work to establish Chicago’s first national park. CHICAGO – National Parks Conservation Association (NPCA) will today honor eight organizations, known as the Pullman Partners, with the national Marjory Stoneman Douglas Conservation Award at a community event at the Pullman National Monument Visitor Center. The groups are receiving the award for their work to establish Chicago’s first national park. 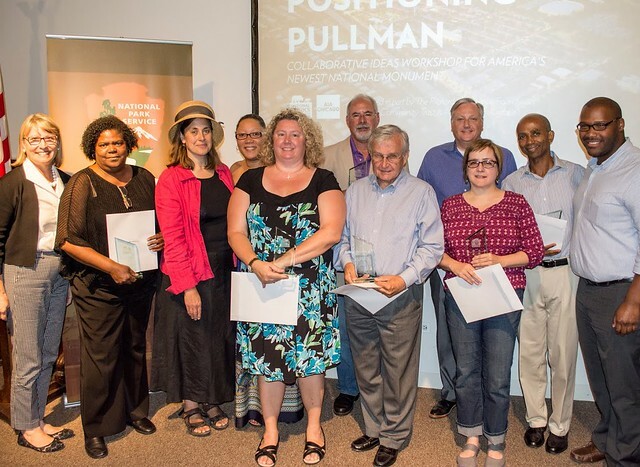 The Pullman Partners receiving the award include: Bronzeville Historical Society, Chicago Neighborhood Initiatives, Historic Pullman Foundation, Illinois Historic Preservation Agency, Illinois Labor History Society, Pullman Arts, Pullman Civic Organization and the Pullman Wheelworks Residents. Together with NPCA, the Pullman Partners built tremendous support for designating a national park at Pullman, supported legislation introduced by Senators Richard Durbin and Mark Kirk and Congresswoman Robin Kelly to establish the park, and sent more than 13,000 individual support statements to President Obama urging the national monument designation. As champions of the “We Support a National Park at Pullman” campaign, the Pullman Partners hosted neighborhood meetings and events, went door to door talking to neighbors, conducted walking tours of the historic neighborhood and answered residents’ questions about the national park idea. They wrote letters to the Illinois congressional delegation and testified before Congress in support of creating a national park at Pullman and their passion never ceased. NPCA’s annual Marjory Stoneman Douglas Award was established in 1986 to honor people who go to great lengths to advocate and fight for the protection of our national parks. Named for Marjory Stoneman Douglas, a life-long advocate for Everglades National Park, this annual award recognizes the outstanding efforts of an individual or group that result in the protection of a national park or proposed site in the National Park System.